Woo challenge 3 for Fashionable Stamping and this time we would like you to use some ribbon or lace on your project. Now to me - that means shabby chic - so that is where I went. I often use paint on the edges for this style but this time I went further and dry brushed the edges of the mounts with acrylic paint. I over stamped the pink mount with white paint and edged the blue mount with blue household paint. The dress form was painted twice with Fresco paint and a layer of crackle glaze between them. I stamped a gold necklet on it. The best wishes mount has been dry brushed and the sentiment stamped with archival ink. Don't you just love this dress form die - it is the most used of any of my equipment at the moment, I hope you are not getting fed up seeing it. A couple of people have said they think it is too big to use on a card but it is very versatile - this is an 8 x 8 ins card, but others I have made have been smaller and one was only 4 x 5 3/4 ins (see earlier posts). Papers from my scrap box. Paint - white acrylic, blue household, Fresco Finish london night and snowflake. Stamps - flourish by La Blanche, sentiment by Anna Griffin, necklet by Hampton Art. Dies - TH sewing room. White flower from Suzanne Klezcar and my own handmade rolled flowers. Brenda, this is just as lovely as can be. The painting layers are just so pretty! Yes, love the dress form die! It is even wonderful as a shrinky! Have a great weekend! Hi Brenda this is just gorgeous, love the vibrancy in the colours - stunning! 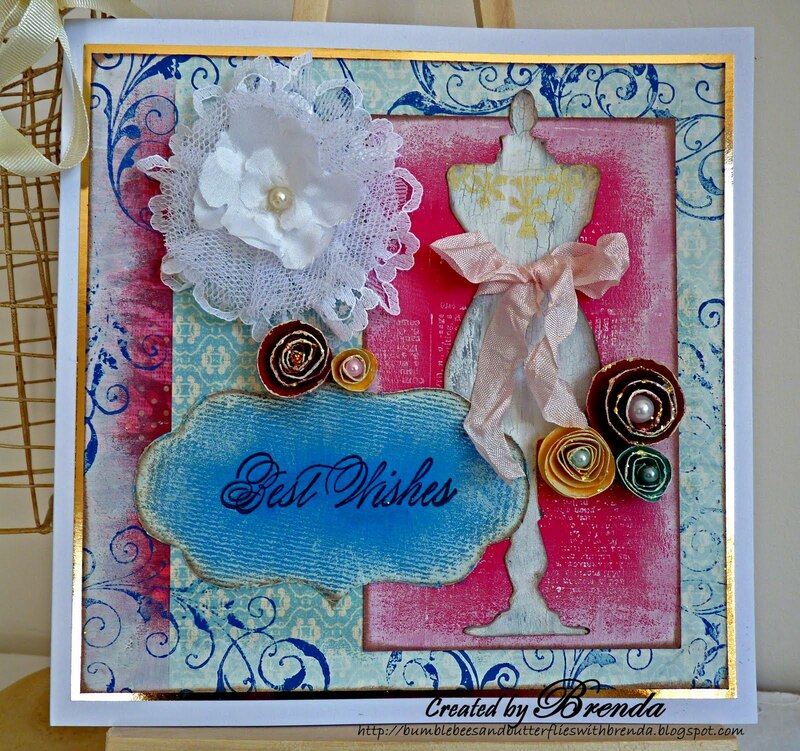 Hi Brenda...I still cannot get enough of your dressform cards...I so love that die, but unfortunately it cannot go through the Grand Calibur...all details are wonderful! Thank you sweets for another beautiful masterpiece, timeless and elegant comes to mind when looking at it. You are sooo talented. Oh do I love the shabby chicness of your card. Beautiful work Brenda, gorgeous background techniques and that dress form die is a must have. Oh wow Brenda--this is really lovely!!!! Just love the overstamping! And the flowers are fabulous! Great job!!! Thanks for playing along with us this week at Speedy the Cat's Friends challenge. This is stunnign Brenda, love the dress form die I haven't tried dry brushing with the acrylic paint - looks great. 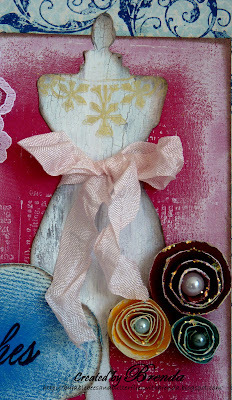 What a beautiful shabby chic card - and I do love that dress form die! Thanks for playing with Speedy's Friends! A real stunner Brenda and I can never have too much of that die as I have it too and have even made an atc with it and I don't think it looks too big. I love all your painty effects and the necklet idea and those flowers are gorgeous. 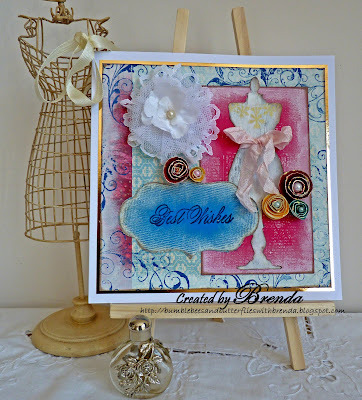 Brenda, such a fantastic card, love the effect on the dressforn and the background. Fantastic color combination. Wow Brenda, another amazingly beautiful card - you've captured the shabby-chic look perfectly. Love the way you share all your techniques - you are an inspiration. Very pretty card. I love all the elements. The lace is perfect. Thanks for playing along with us here at Speedy the Cat's Friends challenge this week. Hope to see you again next week. Wow Brenda this is awesome what a wonderful Shabby Chic card the detail, images and design look amazing I love this big time. how georgous is your card, thank you for joining us at crafts and me this week. There is so much inking and stamping in this ~ Love it! You look like you have had heaps of fun with this card... and it looks great! Oh my, this speaks to my feminie girly side. Who doesn't like some pretties gracing our lives. You did an awesome job with this. It is magnificent. I love it! Thank you for playing along with Speedy the Cat's Challenge this week. It is a pleasure to visit and see your work. We appreciate your support and hope you can play again next week. Good luck in the drawing. This is stunning! Love your rich colors. I really had to look at the pink and the dress form for awhile to figure out if the dress form was on top of it or if the pink was the negative from it. VERY cool! And love your rolled flowers, too. A gorgeous piece! Hi Brenda Ooh this is gorgeous! Love those colours and all the details are perfect. Love all the flowers! Hi Brenda, wow this is great, love how you have used the acrylic paint, you are such a great designer, always know we are going to get something unique when we pop over here. love it.